The Intermediate adventures for experienced adventures but not quite what we call "name" level (9th and above). This is also what many call the prime adventuring levels. Also many of these were ranked in the 30 greatest adventures of all time. While not linked in any particular way, they do sometimes have links to other I modules. I3, 4 and 5 are a mini-campaign. I6 and I10 are sequels. 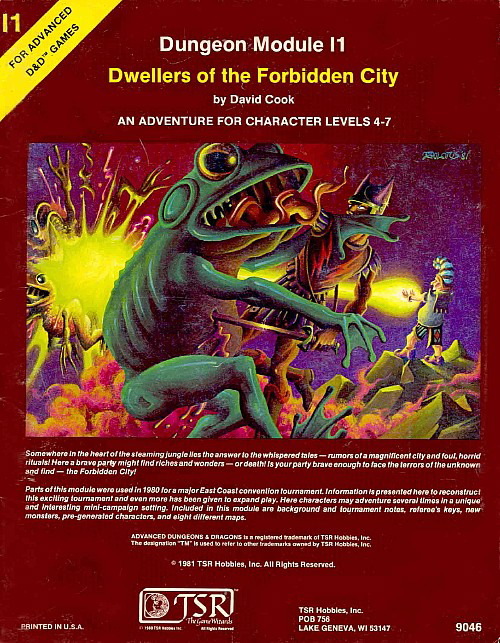 I1 Dwellers of the Forbidden City was ranked as the 13th greatest adventure of all time. 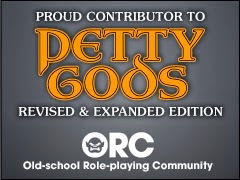 Ravenloft I6 was ranked at #2. I3, 4 and 5, aka the Desert of Desolation series were ranked collectively as the 6th greatest adventure. 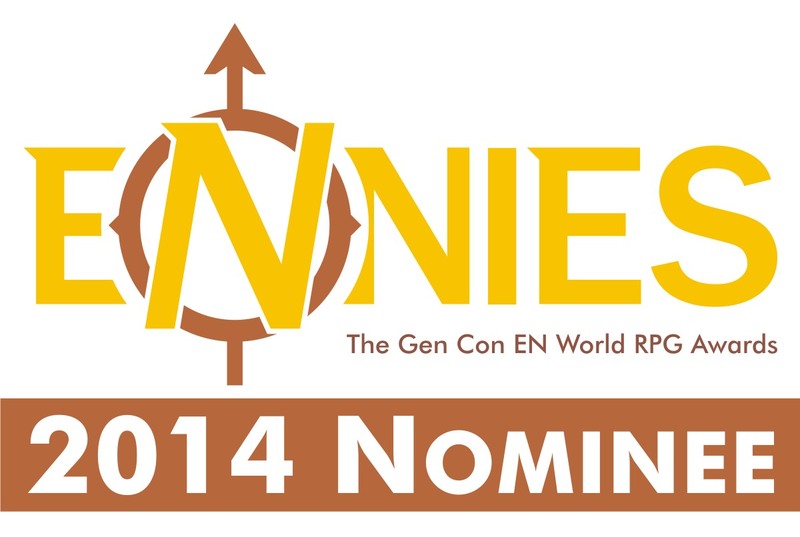 Now I have spoken about Ravenloft so many times that I really don't think I need to do it again here. The same goes for it's sequel I10 The House on Gryphon Hill. I had started Egg of the Phoenix many years ago. 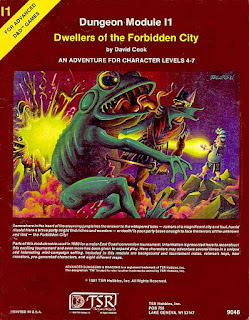 In fact it was the last adventure my long time High School DM ever took me through. After that I was in college and he was doing other things. I would like to run that one too, just because of unfinished business. A lot of these adventures make up what I am calling my "Second Campaign". Dwellers of the Forbidden City and the Desert of Desolation will make up a good bulk of that series for me. I just really need to find a new copy of Day of Al'Ackbar. I lost mine years ago. I am really considering running I10: Ravenloft II for my kids using the new 5th Edition Ravenloft/Curse of Strahd book. I just need to figure out a good place to slot it in. It would have to go before the GDQ series. 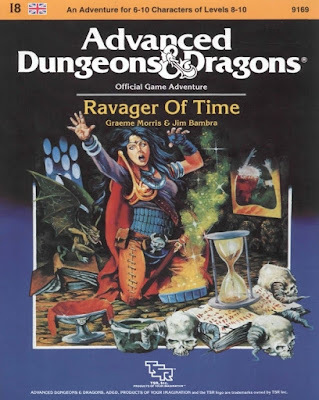 Ravager of Time is an interesting one really. 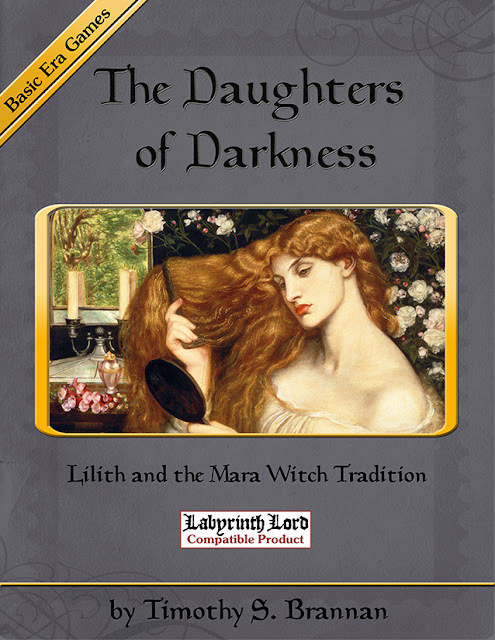 It was written in the UK, but is not part of the UK series of adventure modules. Also the main antagonist, Nuala, is a witch in all but name. So here is Nuala, converted to a Basic Era Witch. This might be a good adventure to add to my War of the Witch Queens. Yeah, I enjoyed thos Ravenloft books back in the day. I won't lie. I own the first six "I" modules and have had the chance to run all of them...multiple times for some. Collectively, they're my favorite set of modules. First, I loved the who theme here of Dungeons & Dragons! I've always thought how much fun it would be to get into it, but that never happened. Still, I love seeing the insider info you've offered up here, Tim! Well done, and heading back to the top to get the full info.